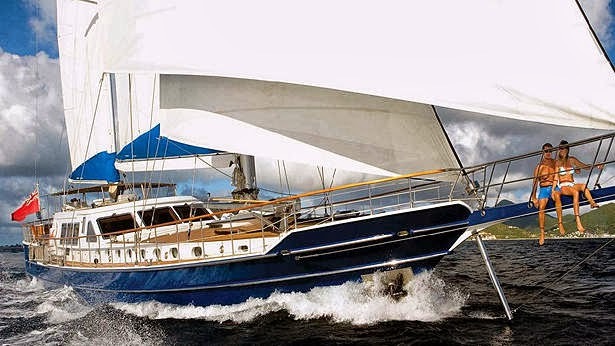 The charter yacht Pacific Wave, a beautiful 72-foot Italian-designed sloop, has a special offer for charters taking place in January 2014. 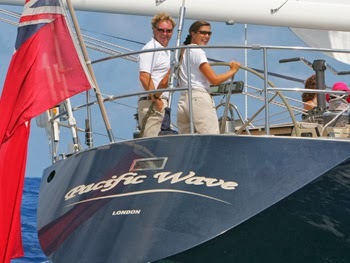 Pacific Wave is offering summer rates on new bookings for charters in the Virgin Islands taking place in January 2014. Save $1500 off standard winter rates. 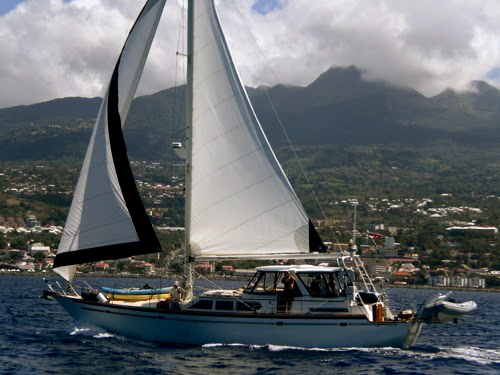 Pacific Wave is a stylish Italian-designed 72-foot sloop with an owner-operator crew of 2. The yacht is fully air conditioned and accommodates up to 6 guests in three cabins all with ensuite head/shower. The master cabin, aft, has 2 double berths, while the other two guest cabins each have a set of single, upper/lower bunks. Pacific Wave has a 15.5-foot dinghy with 70HP 4-stroke motor, adult & junior waterskis, tube, wakeboard, 2-person kayak, snorkel gear, large screen TV/DVD in salon, 4G WiFi available at cost, etc. Both Lynn and Mark are Padi Dive Masters. Diving for certified divers is included in the charter fee. Rent or bring your own gear. Air fills are $10/tank. What an excellent way to start off the new year! It is with great sadness that we share this bit of news from the charter yacht SEA WITCH. We have been fortunate to meet Tulang and we offer Susan and John our sincere condolences. The charter yacht VERNA BREEZE, a 54-foot Lazzara ketch, is now offering SCUBA Diving instruction. 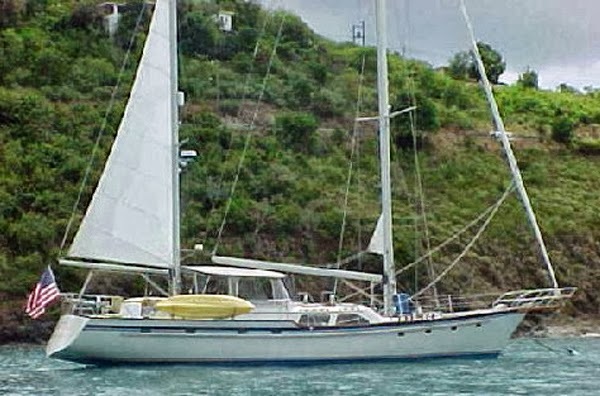 Verna Breeze is a 54-foot Lazarra ketch owned and operated by Chris & Kelly Allison (along with ship's cat Zorro). Verna Breeze is fully air conditioned and accommodates up to 4 guests in 2 cabins. The master guest cabin is forward with a queen berth and has an ensuite head/shower, while the other guest cabin has twin bunk beds and shares the guest head through the hallway entrance. Verna Breeze has a 15-foot dinghy with 75HP outboard, tube, wakeboard, kneeboard, 2 kayaks, fishing equipment, snorkel gear, 2 hammocks, TV/DVD in salon & queen cabin, onboard WiFi, a wonderful awning for the foredeck, and much more... This is a very large 54-footer. RECENT COMMENTS from happy guests! Thank you so much for having us!!! Words can't even start how happy and at home we felt. You guys created a lifetime experience for us. Chris...... Thank you for making my Scuba experience the best ever!!! I felt 100% safe & secure with your guidance. Even though I missed the best dive ever (HAHA). We just loved your jokes and humor!!!! Kelly..... My belly wants to personally thank you for all of your wonderful dishes!!! We can't even pick one over the other. I just loved our after dinner drinks & conversations. The best part was the last two days when we became family and "not a charter"!!! 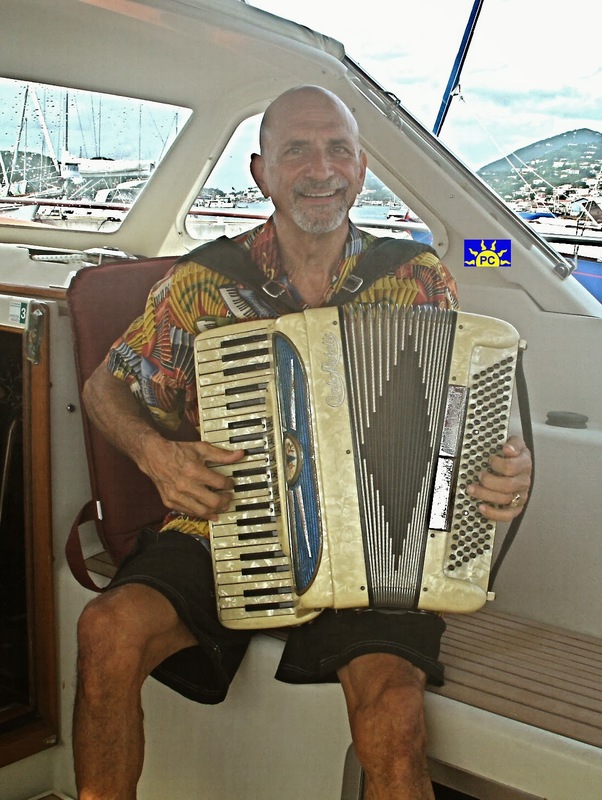 Today we have a guest post from Captain David Goodman, M.D., owner of the charter yacht BEL AMI, a 53-foot Amel Supermaramu. It's a year ago, summer time in Green Bay, Wisconsin, and I'm working a doctor gig in Wisconsin during hurricane season. I'm staying with friends who live in the boonies just north of Green Bay, out for my morning run. Running shoes, short shorts, and little else on. I decide to knock on the door of this neighbor lady who lives round the bend and introduce myself. I knock three times, wait for a while, and as I'm about to leave, the door opens. She looks at me with this wide eyed stare, and no wonder... here I am in all my glory, sweaty and half naked on her doorstep. 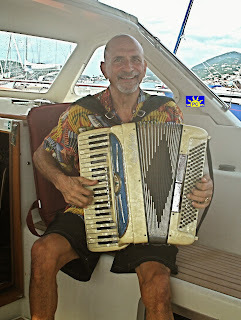 With a big smile on my face I say "Hi, I'm Doctor/Captain/Accordian-man Dave. Thought I'd drop by and say hello." And we've been together ever since. Love and Romance at the ripe old age of 62 (who would've thunk it?). Bel Ami Voyages... Sail Into Romance! Bel Ami proudly presents First Mate Bobbie Strahl. Bobbie's smile lights up the sky, and she has been such a hit with our charter guests, not to mention a hit with me. After owning and operating a horticulture/landscaping business for the past 30 years, she is altering her life course by coming aboard Bel Ami as First Mate, Hostess, Galley Wench, general boat slave, and the love of my life. Am I a lucky guy or what? Love is what makes Bel Ami voyages so special for our guests. And teamwork. Bobbie and I work and play together as a loving team, bringing to our guests a wonderful and contagious energy. We are a 2-pax charter yacht specializing in taking one couple on a unique, romantic sailing vacation. Bel Ami is a 53-foot Amels ketch with a crew of 2, owner-operated by Dr. Dave Goodman. Bel Ami is fully air conditioned and accommodates 2 guests in the aft cabin which has a king-sized bed with ensuite head/shower. Bel Ami has a 10-foot dinghy with 15HP motor, 2-person kayak, snorkel equipment, fishing gear, noodles, hammock, large screen TV/DVD home theatre in salon, TV/DVD in guest cabin, underwater camera, internet access where available. Dave is a vegan but they do non-vegan meals as well. Please note that Bel Ami is a SMOKE-FREE yacht. The charter yacht FREEDOM, a 120-foot Broward motoryacht with a crew of 5, is open for Christmas week in the Virgin Islands at standard rates (no holiday surcharge). They are available for a Christmas charter through December 27, 2013. We can inquire for a less-than-7-night charter if necessary. RATES: All-inclusive 7-night charter in the Virgin Islands, including 5 dives/week for certified divers. Please note that for the Christmas charter there is a crew change due to Captain George's recent skateboarding accident, see crew page in online brochure for update. Same great service, same wonderful boat with all the water toys one could want and, of course, Chef Joseph will perform his magic in the galley. 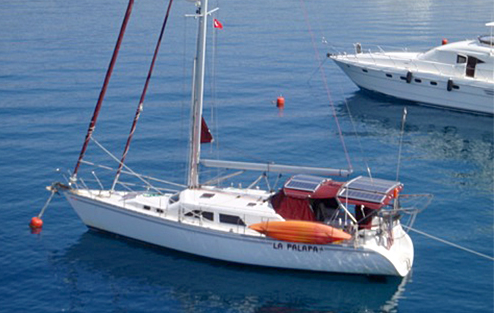 Roger and Aimee of the charter yacht LA PALAPA has just opened their holiday calendar for charters. LA PALAPA is open for both Christmas 2013 and New Year's at standard charter rates (NO holiday premium). La Palapa is a 45-foot Catalina/Morgan with a crew of two. La Palapa is fully air conditioned and accommodates two guests in the forward master cabin with Queen-sized bed and ensuite facilities. 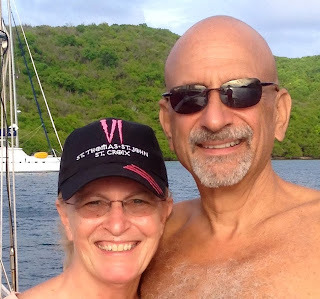 I would like to thank the charter yacht Promenade, a 65-foot Nigel Irens trimaran, for putting me up (and putting up with me) for the two Virgin Islands charter yacht shows last month (Nov. 2013) in St Thomas and Tortola. It was very much appreciated. It was great to spend time aboard Promenade (one of our favorite charter yachts). After spending five nights aboard, I had a good feel for the boat and a better knowledge of the crew than just a 10-20 minute visit at the annual boat show. 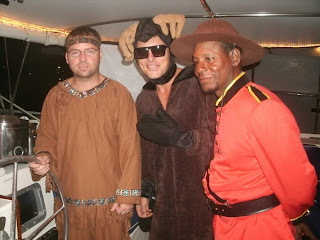 Captain Chad, First Mate Felix and General Dogsbody Chris are excellent. Friendly and attentive but not pushy. The food was good, too! Very accommodating folks. 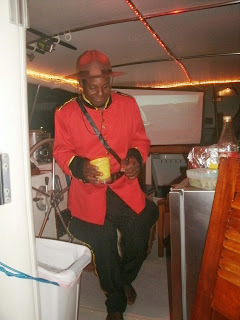 One of the events at the Tortola show was a country-themed night where brokers would walk the docks and participate in parties on various yachts. Promenade's country was, of course, Canada. Wow, was their homemade maple ice cream excellent! Promenade has 5 guest cabins and accommodates up to 10 (and possibly 12) guests. They offer all-inclusive charters. Chad is a dive instructor so diving is available for certified and non-certified divers. Promenade has lots of water toys, beach games, power lounger, exercise equipment such as weights and yoga stuff, fishing gear, dancing... etc! We have a recent post with comments from a family we had aboard this summer and it also has lots of information about Promenade, read this post. Oh yes... Promenade is currently available for this Christmas. They also have a CABIN CRUISE week beginning February 16, 2014. There are currently 3 cabins available. This is a wonderful opportunity for joining a group and charter only one of the five cabins. Great prices, too. 7 nights = $4000/cabin (price for 2 guests, not each person) or 10 nights for $5000/cabin. See more HERE. Here's a link to Promenade's online brochure. 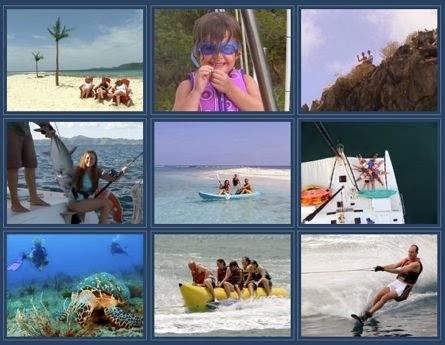 Promenade is an excellent choice for families, friends, and corporate charters. Excellent for active groups, party-hearty sorts, those who want a relaxing vacation, or a combination. Lots of space as it is a 65-foot long and 35-foot wide trimaran. Check out Promenade. They have excellent rates for a 6 to 10-person Christmas charter. Corus is a Whitby 42 ketch. Bill and Ann Hasted are a British couple who have over 20 years' experience in the hospitality industry in their native England, with a successful hotel and restaurant business. Ann's cooking has quite a reputation as she frequently wins various categories in the cooking contest at the annual Virgin Islands charter yacht shows. Corus has a large guest cabin aft with a queen-sized berth, ensuite head/shower and a separate entrance via the center cockpit. Corus has a 14-foot dinghy with 40HP motor, 2 one-person kayaks, snorkel equipment, hammock, DVD on laptop, beach toys, underwater camera & video, Celeston GPS Sky Scout, onboard internet to occasionally check email from ship's computer, or bring laptop and use local hotspots where available, etc. Bill is a Dive Master and includes 4 dives/week for certified divers. Divers may bring their own gear or rent (air fills not included). - CHRISTMAS: OPEN - No holiday premium. Regular rates. - NEW YEARS: OPEN - No holiday premium. Regular rates. - DIVING: 4 dives/wk included for certified divers. Bring your own gear or rent at cost. Yacht supplies tanks and weight belts. Airfills at guest expense average about $15 per fill per tank. Two Much Fun is a 40-foot Manta catamaran with an owner-operator crew of two (Peter & LeeAnn Bonta), plus their Yorkshire Terrier, Mimi. Two Much Fun specializes in 2-person charters. The boat is fully air conditioned and accommodates 2 guests in the starboard aft cabin which has a Queen berth and ensuite head with shower. Two Much Fun has a 10-foot dinghy with 10HP motor, 2-person Hobie Mirage kayak with sail (paddle or pedal), snorkel equipment, fishing gear, TV/DVD in salon, onboard wifi, beach games, musical instruments, etc. - NEW YEARS: OPEN but hold beginning Dec. 28th. Not confirmed so we can challenge. Hypnautic is a 44-foot Lagoon catamaran with an owner-operator crew of two. Hypnautic is fully air conditioned and accommodates up to 4 guests in 2 cabins each with Queen berths and ensuite heads/showers. As you can see from their layout diagram, this is the "owner's version" which has one large cabin in the starboard hull, with Queen sized bed, sitting area, lots of cupboard space, and a separate walk-in shower. Both guests cabins have their own satellite TV, and individual AC controls. Hypnautic has lots of lounging space. 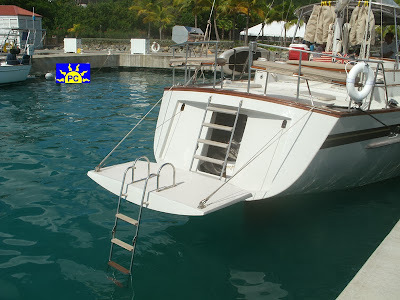 Besides the normal aft cockpit, there is a sunken cockpit on the foredeck in front of the mast, plus there's also seating and a padded sundeck on the flybridge area above the cockpit. Hypnautic has a 14-foot dinghy with 60HP motor, waterskis, tube, wakeboard, kayaks, snorkel gear, fishing equipment, standup paddleboard (SUP), iPod docking station, Satellite TV in each guest cabin, salon and cockpit, onboard wifi, underwater LED fishlights, etc. Paradise is a 54-foot Irwin cutter with an owner-operator crew of two, Bernd & Ruth Bohmfalk. Paradise is air conditioned and accommodates four guests in two cabins. The large master cabin aft has a centerline queen-sized berth and ensuite head with shower/tub. The forward guest cabin has a centerline queen berth with adjoining head with shower/tub which is shared with the crew. Two nice details that are appreciated by all and, especially those with limited ability, is their water access and their cockpit access. Paradise has a lifting swim platform that is an elevator from the water to the top of the transom at aft deck level. Another nice feature is the walkthrough side entrance which allows easy access to the cockpit from the sidedeck without climbing over the cockpit coaming. Paradise has a 12-foot center-console dinghy with 25HP motor, kneeboard, two one-person kayaks, two standup paddleboards (SUP), snorkel gear, fishing equipment, floating mats, water chairs, TV/DVD, and onboard wifi & internet where available, underwater video camera, etc. Paradise also can arrange private, rendezvous diving with a local dive operator for their guests who wish to do a few scuba dives while on charter. - CHRISTMAS: OPEN through December 26. Hold Dec.14-21. Not confirmed booking so we can challenge. - AIR CONDITIONING: The air conditioning is run during meal preparation time and this cools down the entire interior of the boat for the evening. If guests request A/C to be run overnight, there is a $50/night surcharge. 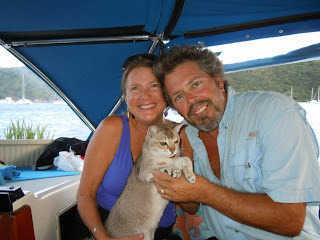 Sea Witch is a 58-foot Pearson sloop owned and operated by John and Susan Stephenson, plus their cat Tulang. 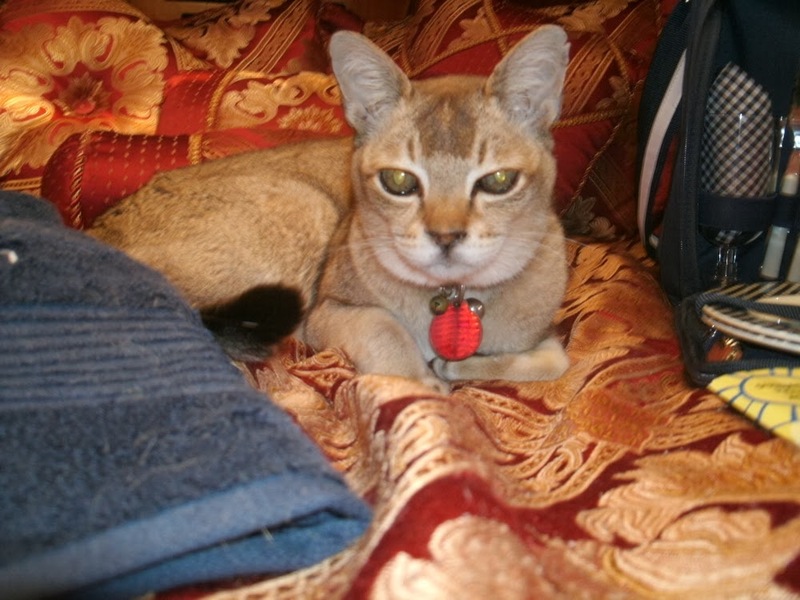 Tulang is a 15-year old Singapora, with short hair and very low dander. Susan says that guests love Tulang and want to take him home at the end of their charter. Sea Witch is fully air conditioned and accommodates up to 4 guests in your choice of 2 of the 3 cabins. The master cabin aft is full-width and has a queen-sized bed on the centerline, and ensuite head (electric) with shower stall. The forward cabin has a large queen-sized V-berth (tapers towards bow) and the mid-ship cabin has upper & lower single bunks. The two forward cabins share a head/shower which also has an electric head and separate shower stall. Sea Witch has a 12-foot dinghy with 20HP motor, 2-person kayak, snorkel equipment, fishing gear, 2 floating mats, boogie board, TV/DVD & massage chair in salon, hammock, etc. Verna Breeze is a 54-foot Gulfstar sloop, owned and operated by Chris & Kelly Allison, along with their two cats, Petey & Zorro. Verna Breeze is fully air conditioned and accommodates 2 guests, 4 if family. The guest cabin is forward with a queen-sized bed and ensuite head/shower. The port-side cabin is suitable for children as it has twin upper/lower bunks (6'5" long) that share the guest head. Verna Breeze has a 15-foot center-console dinghy with 75HP motor, two kayaks, wakeboard, kneeboard, tube, snorkel equipment, fishing gear, TV/DVD in salon and guest cabin, onboard wifi. They have a huge awning to provide shade on the foredeck which is a very nice feature. Kelly is a dive instructor and offers "light" diving to certified divers. Light diving means that the charter is not a dive-oriented charter. - DIVING: "Light" diving (4-5 dives/wk) for certified divers included. Bring gear or rent locally. 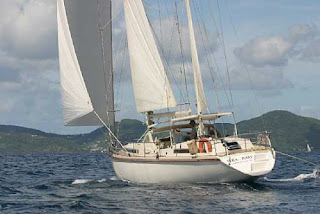 Aloha Malolo is a 65-foot sailboat with a crew of two (Eric is owner-operator). Aloha Malolo accommodates up to six guests in three cabins with 2 heads/showers. Aloha Malolo has an 15-foot dinghy with 50HP motor, waterskis for adults and kids, tube, kneeboard, wakeboard, two 2-person kayaks, fishing gear, snorkel equipment, floating mats, surfboard, boogie board, TV/DVD in salon, portable DVD player, kite kayaking, water trampoline, etc. Salty Dog, a golden lab, is optional. Everyone loves Salty, but Eric understands that not everyone is a "dog person" and they are willing to board her during your charter if requested. Eric, owner-operator of Aloha Malolo, is a dive master, plus he has certification to teach resort/discover scuba courses. Seven dives per week are included in their rates for certified divers. Night dives, too! A Discover Scuba course is included for non-certified divers. Sailing instruction available. We like Eric's "Put Your Wallet Away" philosophy (see Blog Post below). - DIVING: Includes 7 dives/wk with gear, and Resort/Discover Scuba included for non-certified divers. 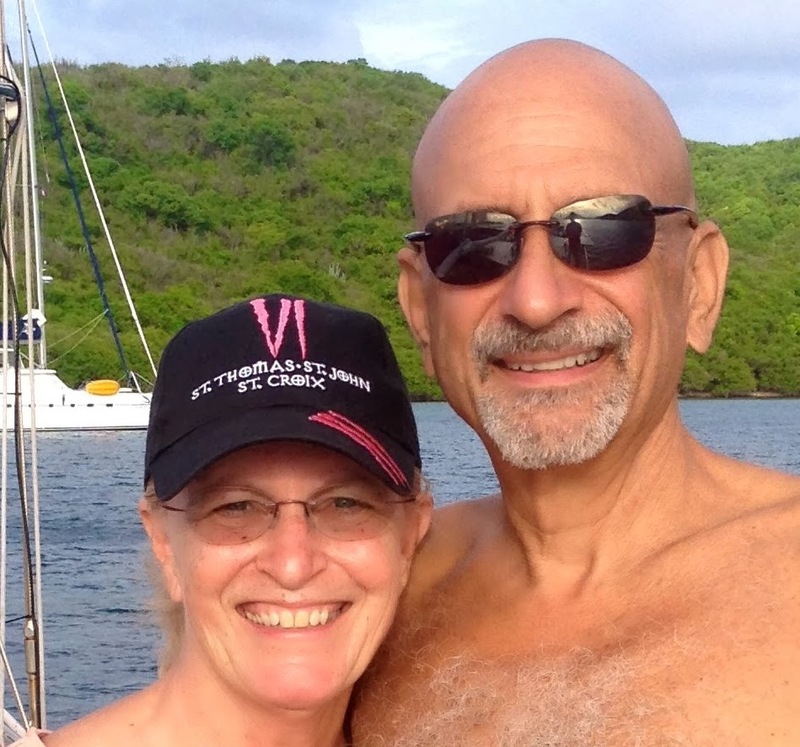 Dreaming On is a 47-foot Leopard catamaran with an owner-operator crew of two; Geoff & Iza. Dreaming On is fully air conditioned and accommodates up to six guests in 3 Queen cabins, each with flatscreen TV/DVD, and ensuite head/shower. They have a 13-foot dinghy with 30HP motor, waterskis, tube, kneeboard, wakeboard, 2 one-person kayaks, windsurfer, standup paddleboard, snorkel gear, fishing equipment, hammock, TV/DVD in salon, wifi where available, etc. Grand Cru is a 46-foot Leopard catamaran with a crew of two. The yacht is fully air conditioned and accommodates up to 6 guests in 3 cabins, each with Queen berths and ensuite head/shower. Grand Cru has a 13-foot dinghy with 40HP motor, waterskis, tube, wakeboard, kneeboard, 2 two-person kayaks, snorkel gear, fishing equipment, floating mats, underwater camera, onboard wifi, TV/DVD in salon, etc. GreenBoat 1 is a 2013, 54-foot Nautitech catamaran designed to provide luxurious accommodations, high performance sailing and leading edge green technology for the smallest carbon footprint possible. GreenBoat has a crew of two, is fully air conditioned and accommodates up to 6 charterers in 3 guest cabins, each with a tablet-controlled TV for music and movies, Queen-sized berth, private ensuite head with separate shower stall. GreenBoat has a 13-foot turbojet dinghy with 90HP motor, tube, 2-person kayak, 2 standup paddleboards (SUPs), waterskis, kneeboard, wakeboard, 14-foot inflatable Hobie Smart Cat sailing dinghy, snorkle gear, underwater camera, 6-person inflatable aqua lounge island, onboard wifi, TV/DVD in salon, projector movie system for outdoor movies, etc. Runaway is an 82-foot Azimut motor yacht, owned and operated by James & Lisa Ringland. Runaway is air conditioned and accommodates up to 8 guests in 3 cabins. The master cabin has a Queen berth, while the other two guest cabins each have a double berth with a single pullman berth over. All staterooms have ensuite head with enclosed shower stall, flat screen television with DVD/CD/MP3 player and individual climate controls. Runaway has a 17-foot dinghy with a 115HP motor, waterskis, wakeboard, two 1-person kayaks, tube, Satellite TV & DVD in salon on 52-inch LCD TV with surround sound, XBOX Video Game System, onboard wifi, etc. Jim is a dive instructor and offers up to 5 dives/week to certified divers for $40/dive/diver, gear included. A resort course is available at $100 per diver which includes one dive. Extra resort course dives are $40, with a maximum of 5 dives total. - DIVING: $40/dive for up to 5 dives/wk for certified divers, gear included. Resort course $100 and up to 4 more dives at $40/dive. Sublime is a 72-foot Irwin ketch, owner-operated with a crew of three. Sublime is fully air conditioned and accommodates up to 8 guests in 4 cabins with double berths and ensuite head/shower. Sublime has an 18-foot dinghy with 115HP motor, waterskis, wakeboard, tube, 2 paddle boards (SUPs), hammock, TV/DVD, snorkel gear, fishing equipment, etc. Brian is a dive instructor and diving and instruction is included. - DIVING: Included for certified & non-certified divers. Instruction included (inquire). Cap II is a 76-foot CNB Bordeaux 76 sloop with a crew of two. Cap II is a beautiful sailing yacht that accommodates up to eight guests in four equivalent double cabins, each with ensuite heads/showers. The yacht is air conditioned and has a 14-foot dinghy with 50HP motor, tube, wakeboard, snorkel equipment, fishing gear, TV/DVD in salon, etc. 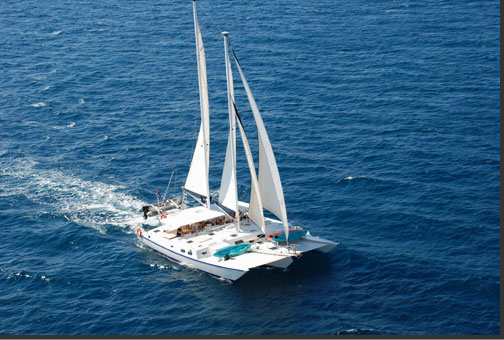 Shangri-La is a 65-foot catamaran with a crew of two. Shangri-La is fully air conditioned and accommodates up to 8 guests in 4 guest cabins, each with flatscreen TV/DVD and ensuite head/shower. Promenade is a custom 65-foot trimaran with a crew of three. Promenade is fully air conditioned and has five guest cabins: 2 kings and 3 queens. The king cabins may also be made up as singles, if requested, making a total of 7 beds. The two forward queen cabins have ensuite heads, while the aft queen and king/twin cabins share two heads. Promenade has a 15-foot dinghy with 50HP motor, waterskis for adults and kids, kneeboard, wakeboard, tube (4-person Predator also referred to as the "couch of doom"! ), two 2-person kayaks, 6-person "power lounger", snorkeling gear, fishing equipment, 32" flatscreen TV/DVD, iPod with 5000 songs, air compressor to fill scuba tanks. Lots of toys. WiFi where available, bring your laptop. Promenade has a dive instructor so inquire for resort courses or other diving instruction. Promenade offers casual diving for certified divers: $20/diver/dive with gear rental, if needed, for $125/wk/diver for BC & Regs. Promenade is one of the very few crewed charter yachts in the BVI that carries a commercial fishing license for the yacht. They carry ballyhoo and lures for trolling, a casting net for live bait, frozen squid for bottom fishing, 2 trolling rods, 3 bottom fishing/spinning rods, gaff hook, landing net, various lures, bottom tackle and hand lines as well as 4 rod holders on the aft deck. Overnight air conditioning $65/night, on request. - SPECIAL RATE: Christmas: Only $12,000 for up to 6 guests, add $750 for each additional guest (8 guests=$13,500, 10 guests=$15,000). The charter yacht Stargazer, a 75-foot Irwin ketch with an owner-operator crew of two, has an attractive special offer that requires you book your charter (not take place) by the end of November 6, 2013. We would like to welcome Queen South III, a 118-foot motorsailer, to the yacht charter fleet. Her plans are to charter New England in the summer and the Caribbean in the winter. A stunning 118-foot motorsailer launched in Tuzla, Turkey in 1999, QUEEN SOUTH III will be heading to the Caribbean for the coming winter and will make her "charter debut" at the Antigua Charter Yacht Show. Having been used exclusively by her owners since her build, she has been impeccably maintained and has just completed a year long refit and mechanical and electric update at Hinckley’s Rhode Island yard. Superb cabinetry, exotic woods, and lavish marble baths create 'Old World charm' throughout which compliments her traditional lines. Accommodations for 8 guests rival those of 100’ motor yachts, with the full-width master stateroom aft of the salon for privacy. The master bath’s twin vanity and floors are marble, complete with bidet and Jacuzzi tub. The queen VIP stateroom and two guest cabins with twin lower singles forward have en suite marble baths with walk-in showers. On the covered aft deck are two large tables with L-shaped banquets for alfresco dining. Comfy padded sunbeds on the forward deck offer a quiet refuge for napping or basking in the tropical sun. Water toys, including a jet ski, are ready for adventurers. Captain Edson Hazell leads a crew of five. Born in Mustique, Edson grew up sailing in the Caribbean. He went on to work on his grandfather’s fleet of island built wooden schooners. After obtaining his captain's license, Edson began working as a charter captain in 1975. He has helmed a variety of yachts including the Alden schooner YANKEE and Little Harbor sloop AMULET and is renowned for his warm hospitality and high standard. Edson has been the skipper of QUEEN SOUTH III for 9 years.